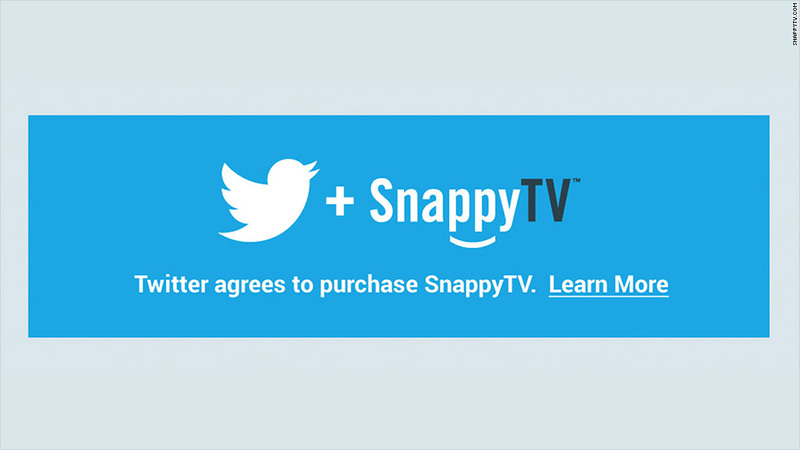 Twitter wants to make TV viewing even more social with its purchase of video startup SnappyTV. Twitter is extending its push into "social TV." The company announced Thursday that it's buying SnappyTV, a San Francisco-based start-up that makes software for quick edits of live video and television into short clips. SnappyTV's technology is already used by a number of brands and media companies to post videos on Twitter (TWTR), including news clips and sports highlights. "As Twitter has grown as the companion to live events and broadcast media, SnappyTV will help partners and brands bring the best videos into the conversation," Baljeet Singh, Twitter's director of product management, said in a blog post. The firms didn't disclose Twitter's purchase price. The deal follows Twitter's acquisitions earlier this year of French start-up Mesagraph and the UK's SecondSync, both of which provide data on social media conversations about television. Twitter made a big push into video last year with the unveiling of Vine, an app for sharing short video clips. But Twitter has struggled to maintain momentum in user growth lately. The company's stock is down nearly 40% this year, and chief operating officer Ali Rowghani resigned last week.